Oro Valley, Arizona – A single tenant medical building at 1856 E Innovation Park Drive in Oro Valley sold in an investment sale for $1.32 million ($233.46 PSF). 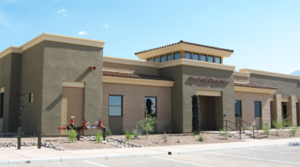 The 5,654-square-foot building was purchased by California investor, La Mantia Family 2001 Trust, and was fully occupied by Oro Valley Pediatrics. A group practice with a single location, Oro Valley Pediatrics specializes in Pediatrics with four physicians. The office offers separate sick and well waiting areas and provides a more home-like environment for families. Physicians offer traditional pediatric care as well as some alternative care including a referral base to traditional and alternative care pediatric providers. Oro Valley is located north of Tucson. The Medical Office is adjacent to Oro Valley Hospital and Oro Valley Marketplace is anchored by tenants such as Walmart, Best Buy, Dicks Sporting Goods and more. Tony Reed with Long Realty represented the seller, Roberts-Smith Properties, LLC Trust (Dr. Carl Robert, manager) in the sale leaseback transaction. Rick Kleiner of Cushman & Wakefield | Picor represented the investor. For more information, Reed can be reached at 520.918.5189 and Kleiner should be contacted at 520.546.2745. To learn more, see RED Comp #6400.